Yannick Bisson | TV, eh? 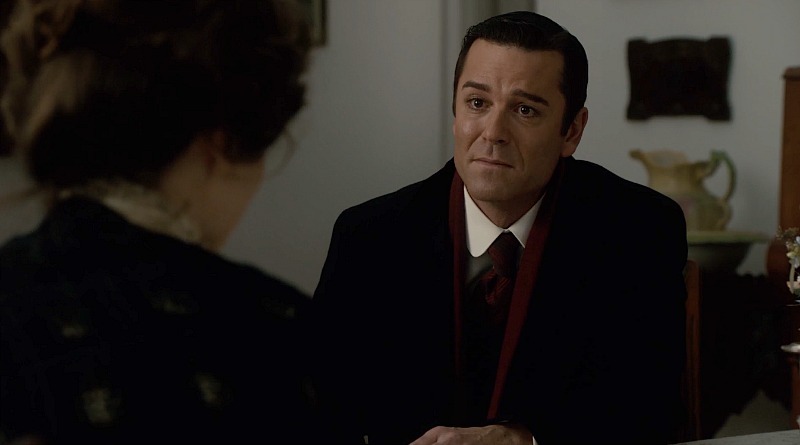 Covering an entire season of Murdoch Mysteries with previews and post-episode interviews—as I have for the past several years—just isn’t complete unless I’ve spoken to Yannick Bisson. Our chat couldn’t have come at a better time. Monday’s newest, “Sins of the Father,” dealt with the death of Det. William Murdoch’s father, Harry. Though he was only portrayed by Stephen McHattie for two episodes, the impact Harry Murdoch has had on his son has endured. And, unsurprisingly, William acted as though Harry’s demise didn’t affect him. But, as evidence began to suggest murder rather than an accident, William sought justice. We spoke to Bisson about the episode, his acting choices, Season 12 overall, and his very un-Murdoch-like role in Another Wolfcop where he plays a villain named, yes, Swallows. I feel like this has become a yearly event, checking in with you. Every year I say, ‘Congratulations on another season,’ but congratulations on Season 12 of Murdoch Mysteries. I’ve loved it so far. Yannick Bisson: Well, this is my phone call I look forward to because if I’m talking to you, that means we are still in business. Before we specifically get into ‘Sins of the Father,’ I want to get your take on this season because there have been a few things that have been notable. I want to start with the ‘Sir. Sir? Sir!’ episode, which I think was the most controversial of this season. What was your take on the wacky, Halloween themed episode? YB: It was great. I mean, we have to take a step aside sometimes and have some fun, and that’s really what a lot of these types of episodes … we’re somewhat blatant with it, so that there’s no mistaking that we’re just going outside the envelope a little bit here and trying something different. We did that in the past with the ‘Weekend at Murdoch’s’ type of episode, so it’s clear that this is not sort of part of the canon if you will, or whatever you want to call that. We’re doing something creative, we’re trying something different, and hopefully, you’re along for the ride. Now, not everybody responded the same way, unfortunately, but we don’t always do it just for the audience. Sometimes we do episodes for us. As an actor, although you’re enjoying the ride, it is nice to shake things up a bit. YB: Well, absolutely. I mean, that’s a big part of it for me is doing different things, doing new things, but also within the show having new experiences, meeting new actors and it’s just like any job. It’s great to have new challenges and new opportunities. So, as much as I look forward to other projects completely outside of Murdoch, I also look forward to doing things a little bit differently within Murdoch. That’s been fun to do when we’ve travelled to other countries or done wacky episodes. William and Julia’s Frank Lloyd Wright house is amazing and not only a refresh for the couple and the set but also the forward-thinking of this couple as we’re gradually moving into further along into the history of the show and the history of Toronto. YB: Oh, absolutely. It’s good to have these contemporaries sort of float through the timeline of Murdoch, so we’re able to talk about people like Frank Lloyd Wright, which a lot of people associate his work with closer to the 30s and the 20s and stuff like that. So, being able to say, ‘Oh, no, no, no, no. Very early in his career, this is possibly the very first year of his public career,’ and so on. We’re able to do that, which is a lot of fun and certainly educational because I definitely would have pinned him as doing the bulk of his work, or certainly the most notable stuff, in the 30s. I had no idea. I know it’s a good episode of Murdoch when I quickly go to Google and start Googling things to find out more information. So, this past week was kind of a twofer. First of all, Nikola Tesla, always great to have him on the show and got me reminiscing about ‘Power.’ But also Elvis Stojko, who told me that he had a fantastic time. What was it like working with him one-on-one in the interrogation room? YB: Oh, he was hilarious. I mean, I was laughing out loud at stuff that he was doing and it certainly wasn’t expected. I didn’t know at all what to expect, especially since on the page, that particular scene was pretty funny and then for him to come in and actually be even funnier was a really pleasant surprise. I mean, such a great guy. We reconnected since in the skating world. I went and visited their Thank You Canada show with Tessa Virtue and Scott Moir and Elvis. So, it was a cool connection to make and I’m just so hugely proud of our Olympic athletes. As you know, I’m a very, very proud Canadian, so it was just like heaven for me and then for him to do such a knockout job. It was hilarious. He didn’t want to look as though he was a figure skater showing up and not be taken seriously. YB: That’s right. That’s right. He told me about that. He’s also got that mindset of if you want to accomplish something, you’re gonna have to put in the work. You gotta prep. You gotta do what you gotta do and then you’re gonna get the results out of it with the effort that you put in. That seems to be his approach, and it’s kind of cool. Everybody has a different process, a different approach. I certainly appreciated that. Let’s get into Monday’s episode. The director, Mina Shum, filmed some beautiful scenes of William. The quiet one at the beginning of the episode where he’s in the forest, and then in Harry’s room, going through the suitcase and those old memories. Very unlike some of the scenes that we see in Murdoch. YB: Yeah, it was funny, from the moment the script came up I started to sort of feel a lot of that stuff and feel a lot of that sense of helplessness, that sense of being let down, the sense of incomplete relationship, a sense of anger, all those different things. It was easy. It came off the page very, very easily for me. The weather cooperated in so many ways because of that read of looking up to the sky and seeing possibly something. I actually added that in, I think. I know I did in a couple of spots. I’m not sure if it was my idea altogether, but I know that I added it in a couple of spots and when I saw the edit, I saw that they kept it in there, so that was interesting because I sort of thought it was almost as if Murdoch conceded to the fact that his father went the way that he should go and that he’s up there and he’s sort of conceded to what Julia says about maybe it was this, maybe it was that. In the end, it may not be perfect, but it was the way it was. So, the weather kind of cooperated with that, which was kind of weird because at first, it’s gloomy, it’s dark. It’s very unclear and then towards the end, the sky’s starting to part a little bit and it’s a little more clarity. It created a cool symbolism of what Murdoch was feeling. It was quite interesting to see Simon McNabb credited for the episode because when I think of him, I’m not necessarily thinking of those emotional moments, I’m thinking of funnier moments. YB: Yeah. And that just goes to show you the depth of our lineup, the depth of our roster, you know? When William is in the morgue and Harry’s body’s on the table, William is as about as far away from the body as you can get without being out of frame. Was that a conscious decision that he just doesn’t want to go near the body? YB: Yeah, definitely. I played that physically in tone. He, I thought, very early on put a wall between himself and the entire situation and that becomes clear in the dialogue between the other characters of the story, but he definitely throws up a wall and is protecting himself, but also doesn’t want to lower himself to some possibly very base level, even though he would for other people. He would seek out justice for other people, but with his own father for some reason, he was judge, jury and executioner and so I wanted to physically show that. YB: Yeah, I know. I know. The reality is it’s probably really difficult to get Stephen McHattie, but there’s also a great opportunity in that script, so it’s like you gotta pick and choose. 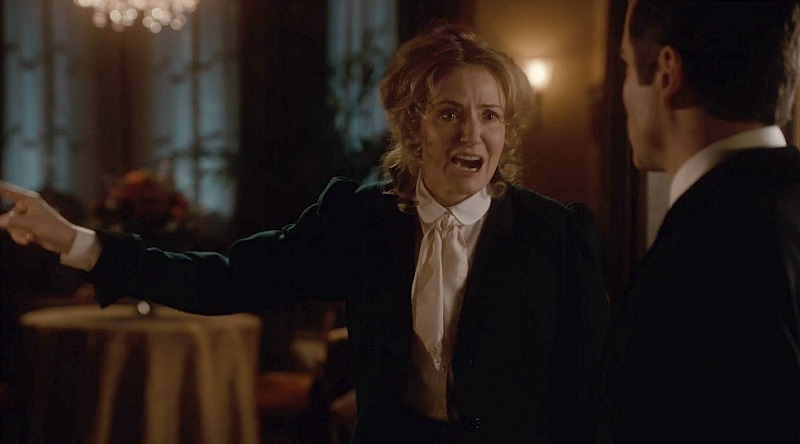 Speaking of actors, I couldn’t believe that Sara Botsford and Peter McNeil, neither of them had been on Murdoch Mysteries until Monday night. What was it like working with them? YB: I know, isn’t that funny? Peter and I go way, way back and Sara, obviously she’s been part of Canadian fabric for so long. It was so incredible to have them both there and I thought a real privilege. They were both so sweet. They were both so complimentary and proud of the show and the accomplishments of the show and the cast. It was just such a sweet time to have them there because these guys are veterans. People like Peter have appeared in some of the biggest movies ever. So, it was just very sweet for them to A) take the time to do the episode with us and then B) to just come around and just, ‘Heck yeah, we want to be part of this. We’re so proud of you guys.’ So, it was a very sweet time. We just got a handful of episodes left before the end of the season. Obviously, you’re not going to give anything away, but I’m assuming it’s going to be a bit of a rollercoaster heading into the two-part season finale? The writing room is turning out stories that continue to be incredible, and then with the fact that we got to see some back stories of some of the supporting characters, this has just been a great season all around. YB: Absolutely, and funny enough, all of that great sort of enriching of the secondary characters, everybody’s back story, has actually been a huge blessing for me this past year because it gave me so much downtime that I’m starting to wonder if I was getting written out of my own show. But, it was really great and I think the show has been better for it, because a lot of people are attached to … the bandwidth is much broader now, the attachment to the characters and to their story and to what they want. One last question. How much fun was it being in Another WolfCop? I saw the movie over the holidays on Super Channel, and man, you’re fantastic in it. YB: Oh, I’m so glad to hear when people have seen that. It was such a blast. I actually enjoyed working with those guys so much that I partnered up in the production company and we’ve since made some other projects and there are more coming. But yeah, the whole WolfCop thing was so much fun and being able to play that just hugely reprehensible character, it was so great, so great. It’s worth it just to hear you swear. YB: Oh, I had a whole bunch more. I had a whole bunch more because they would just tell me, ‘OK, start ripping.’ We banked all kinds of stuff that the world will just never view. But I tell you, that was fun. It was kind of like decades of holding back and I just let loose on it. Murdoch Mysteries airs Mondays at 8 p.m. on CBC and streams at CBC Gem. Elvis Stojko will always be thought of as a world and Olympic champion figure skater. But Stojko is an actor too and relishes tackling new roles when he has time off from the rink. Have you been a fan of Murdoch Mysteries? My wife and I started watching, we started from the beginning so we’ll binge for a little bit. I think we’re up to Season 3 now. We want to watch it from the beginning and get all of the characters sorted out. We both love period pieces. I love that stuff. Then [in this episode you have] Nikola Tesla, and I was like, ‘Aw, this is awesome.’ And then they slipped in Albert Einstein. That cracks me up. It’s really great. Those are the things I love about the show, and we were just getting to know characters and how the romance between Murdoch and Julia, how that whole thing is building. So, we were getting into it and we became fans and then, later on, doing the acting thing and I had a connection to [executive producer] Christina [Jennings] and being able to audition for the show and get on was pretty exciting. ES: I was meeting with some producers and I had some projects that I wanted to bring through a friend of mine as well, that I had episodics and stuff. And I was able to connect with Christina to take a look at some projects. They said, ‘You know, I think we should get you in an episode of Murdoch. That would be fantastic.’ I didn’t hear for a while from them, because they were busy and everything. And my agent kept checking up with Christina, and they said, ‘Yeah, I think we got something for Elvis that would be really great.’ Obviously, they wanted to see how I would do, so it was sort of an informal audition. It was nice because the director was in the audition room, which doesn’t typically happen during casting. It was great because we played around with some stuff and wanted to kind of get an idea of what I could do and what I was playing with. I was working with my acting coach on it, and then it went from there. It was so great to work with Yannick because I’m actually with Murdoch, which is awesome. Nikola Tesla is a big fan favourite. I loved him since the very first episode of Murdoch Mysteries back when it debuted in 2008. He’s only been back a couple of times since then, and one of them is in Monday’s episode. So yeah, you were in a landmark and exciting episode. I’m glad that they didn’t say, ‘OK, we’re getting Elvis Stojko, so let’s come up with a reason to put some skates on him.’ I like the fact that they didn’t do that. ES: The thing is I want to separate myself from that, I don’t want people saying, ‘Well, he got the part cause he’s a skater.’ Because I’m studying acting. I’m an actor. I can hold my own, I’ve been in Chicago. So, it’s one of those things where separating myself from that and having people see me as an actor, not as a skater that’s acting. It’s important to kind of change that branding. Obviously, seeing your name in the credits will cause people to look for you, but you’re not totally recognizable. Maybe I wouldn’t have recognized you if your name wasn’t in the credits. I mean that’s part and parcel of being a good actor, is that you’re immersed in the character, and the wardrobe and makeup helped as well. And it took time, of course. It’s taken a number of years to get to that point. And with this, it was great because I’ve worked with Brad Milne at Milne Studio, and Lewis Baumander was the one that really helped me on this project. And as soon as they put me in the costume and I did the piece, it was kinda like I was absorbed in the character. It’s not like, ‘There’s Elvis, he sticks out like a skater.’ I’m glad that you saw that because it wasn’t a lot of makeup. A lot of people that I speak to talk about how important it is, particularly in a period piece like Murdoch, that how much the wardrobe and the makeup really help them get into character. So by the time you get to set, you’re already there. Was it the same for you? It sounds like it. ES: Yeah, when we went for the fitting, with the bowler hat and everything … I kinda settled in and they talked about the sideburns, which we did later. The hat, I was like, ‘Oh great, I got a bowler hat. This is kinda cool.’ And then, I didn’t realize I would have one until I got on set, and then I just grabbed a hat and just kinda used it as that’s his thing. On a cellular level, you just become that time and space. And of course, Yannick is just so awesome. It’s what he does. He’s a master at it. As soon as I was with him in the room, there were no cameras. It was just me and him. I didn’t see anything else, it was just the character. I really worked on getting good at doing that. It’s very different obviously in theatre, where you have an audience, but it’s a little bit different where you can be intimate but then you have a bunch of cameras around and guys just hanging out, the sound guy. Working with Yannick was wonderful because it was just that moment where I could immerse myself fully into it, and it made playing it much more at ease so I could just relax with the character and not be too tense, which was nice. How many days were you on set, Elvis? A couple of days, just one? So, we met this character of Sam, and the thing about Murdoch Mysteries is that there’s always a mysteries that someone’s getting killed off. Sam didn’t get killed, so you could come back! ES: Well, that would be great. The way I portrayed Sam is that he’s an ex-con, not very smart. He’s a dumb hitman that just wants the money. That was the play on it and I played it a little bit more and that’s what the director liked because I kind of had a little bit of … instead of playing it seriously, played it a little funny. At the beginning, he thinks he’s the smartest guy and then all of a sudden, ‘I think I said too much.’ As he tries to get himself out of the hole, he keeps digging himself deeper. And that was the whole gist of the character. It’d be great to have him come back and kind of muddle up something. I mean, it’s one of those characters that he could be one of Murdoch’s guys on the street that kind of give him some info on what’s happening, right? What have you got coming up either acting or otherwise in 2019? I think, is it the Thank You Canada special? You were part of that, that’s coming up, right? ES: Yeah, that’s coming out on the 10th of February. We finished that up. My wife and I did a show down in Virginia. We had a four-year contract with Busch Gardens Virginia, so we did, like, 65 shows there. This is our fourth year doing it. And that was a lot of fun. That was butted up against the Thank You Canada tour. Came back, because I shot Murdoch, then went on tour, then did Virginia, then came home. And now I’m just gearing up for a bunch of skating shows in March and then of course Stars on Ice, which I’m doing in the spring. But in the meantime, I’ve got a movie I’m filming next week, an action film. I’ve got another, just a small part in it, due to the fact that they wanted me in some other stuff but I had a previous engagement last week to go to the National Championships and be an ambassador, so the shooting date didn’t coincide. But I play a military guy in that. In the fall they’re going to do the Thank You Canada tour but they’ll call it something different. It’ll be different again, it’ll have other skaters as well; the same group but some more skaters. They may dip down into the U.S. as well. So we’ll see where that heads, it’ll probably be a little bit bigger. It’s definitely building for the year, but I leave the summer open for all my acting and auditions and especially for stuff I know that they shoot during that time, so we’ll see what comes of it and, you know, that keeps me busy. What did you think of Elvis’ guest-starring role on Murdoch Mysteries? And what did you think of this episode overall? Let me know in the comments below! 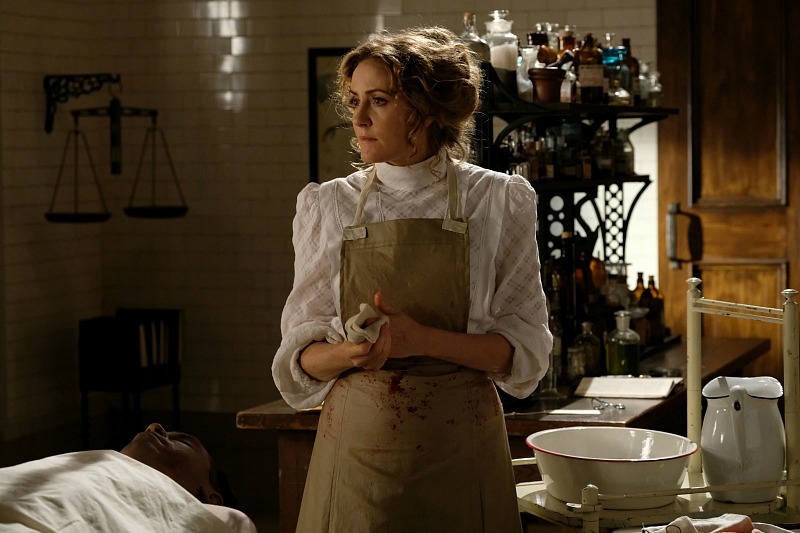 Murdoch Mysteries airs Mondays at 8 p.m. on CBC and streams on CBC Gem.